8th of April 2015 – Collective Architecture has won the £4m job to transform the Briggait, a Category A-listed former fish market, into an arts centre, reports the AJ today. Collective Architecture were recently involved in this building with their The Empire Café – An exploration of Scotland’s relationship with the North Atlantic slave trade through coffee, sugar, tea, cotton, music, visual art, academic lectures, poetry, debate, workshops, historical walks, film and literature. The café was based in the Briggait (home of the Merchant’s Steeple) in Glasgow’s Merchant City and ran from 24th July – 1st August 2014, during Glasgow’s hosting of the Commonwealth Games. 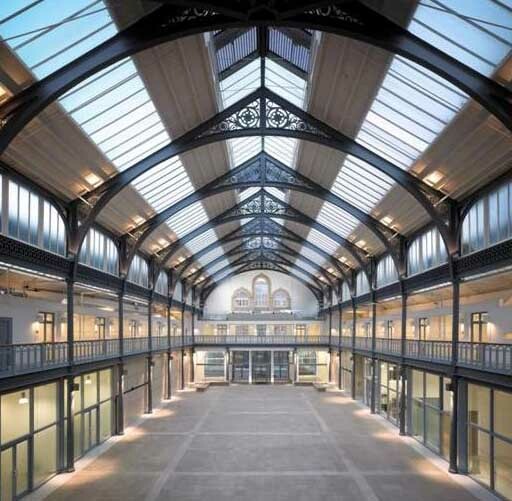 The Briggait, formerly the city of Glasgow’s fishmarket, occupies almost all of a city block on the north bank of the Clyde and has been described by Historic Scotland as ‘Scotland’s most important collection of surviving market halls’. The Briggait ceased to be used as a fishmarket in the 1970’s was converted to a speciality shopping centre during the 1980’s. In converting to a shopping centre, the great halls – effectively one large space interrupted only by columns – were sub-divided with blockwork walls and glazed screens to form individual shop units. A series of shop and café/bar units were created along Bridgegate and Clyde Street and mezzanine floors were inserted. The centre, however, failed to find its place in the city’s retail sector and closed a few years later. The central aim of the project is the provision of high quality studio and workshop facilities for visual artists balanced against the requirement to respect the historical and architectural integrity of the complex of buildings that make up The Briggait. Consequently, it was decided that the great hall of 1873 hall should remain as it was always intended to be – a large, single volume – and that alterations in this area would be largely limited to the reconfiguring of the fabric installed during the 1980’s conversion, the restoration of the original historic fabric, and some carefully planned modern `insertions`. 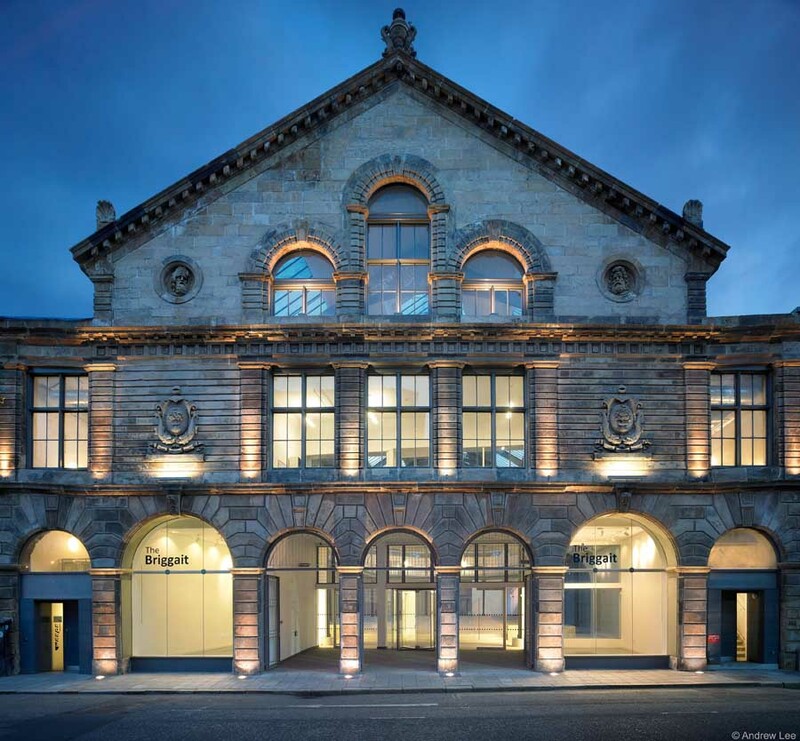 The more public functions have been focussed on the ground floor of the 1873 hall to allow the largest number of people to enjoy the most architecturally significant part of the building, and a new life has been given to one of Glasgow’s ‘lost’ architectural gems. Main Entrance – The original dual entrances onto Bridgegate, whilst a historical feature of the building, were identified as being potentially confusing and inappropriate in scale to the new more public role the Briggait will now play. In order to create a more clear entrance sequence and an entrance that was more fitting in scale to the great hall beyond, the central shop unit constructed during the 1980’s conversion has been removed and a new entrance made using the three central arches. Exhibition/Event Space – a flexible exhibition and event area has been created in the central space of the 1873 hall. 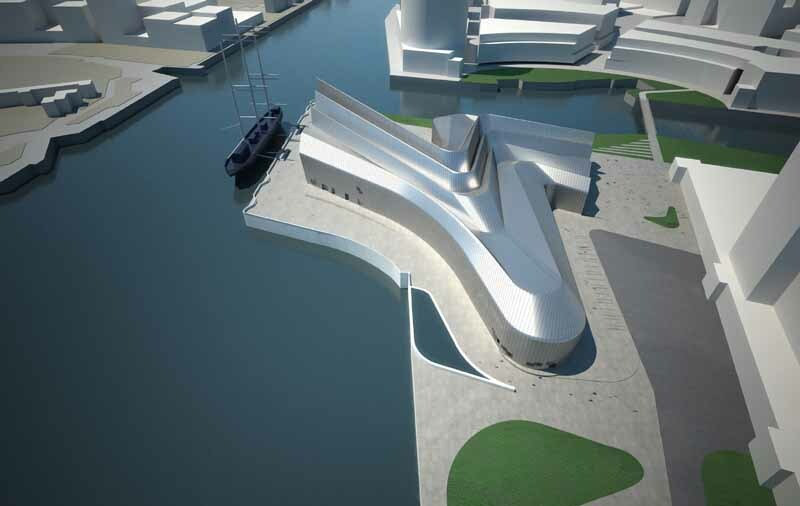 It will host exhibitions of sculpture, paintings and multi-media installations, building on the success of previous events held in the space. 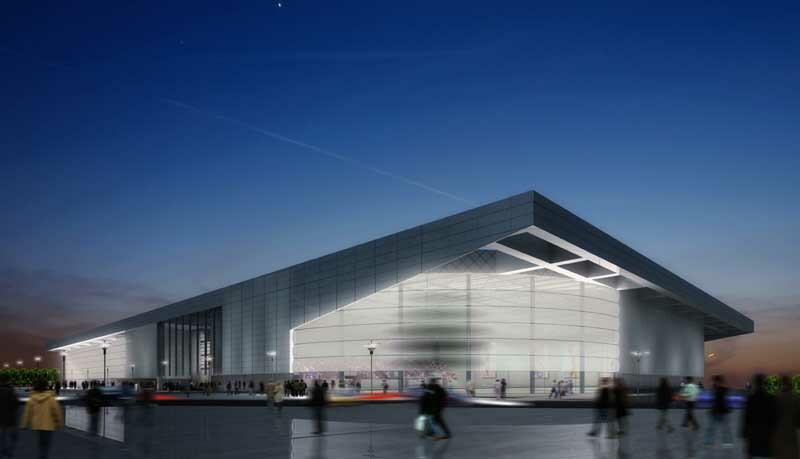 It is envisaged that conferences and seminars will be held in the space as well as markets relating to the artistic activities within the building. 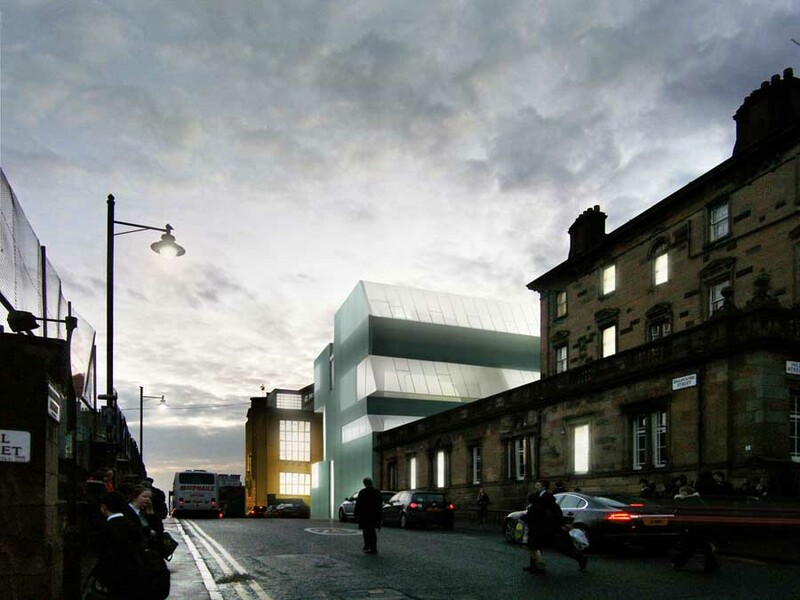 A key element of the architectural response to the Briggait complex has been the aim of revealing the 17thC Merchants Steeple and, in so doing, re-establish its role as a major landmark in the urban landscape of Glasgow. A new atrium space has been created adjacent to the steeple by cutting away part of the existing mezzanine floor, bringing light into the centre of the plan. The space formed by this intervention has become the main circulation hub for the building, and is the primary route for all the artists. The 1914 extension was re-developed during the 1980’s with the creation of a series of double-height retail and leisure units along the Bridgegate frontage along with the construction of a new first floor level office `shell`, It was decided that the existing empty shop units facing onto Bridgegate would brought back into use as Creative Industries Units; that is small shops or offices occupied by tenants, such as designers or jewellery makers, involved in the creative industries. 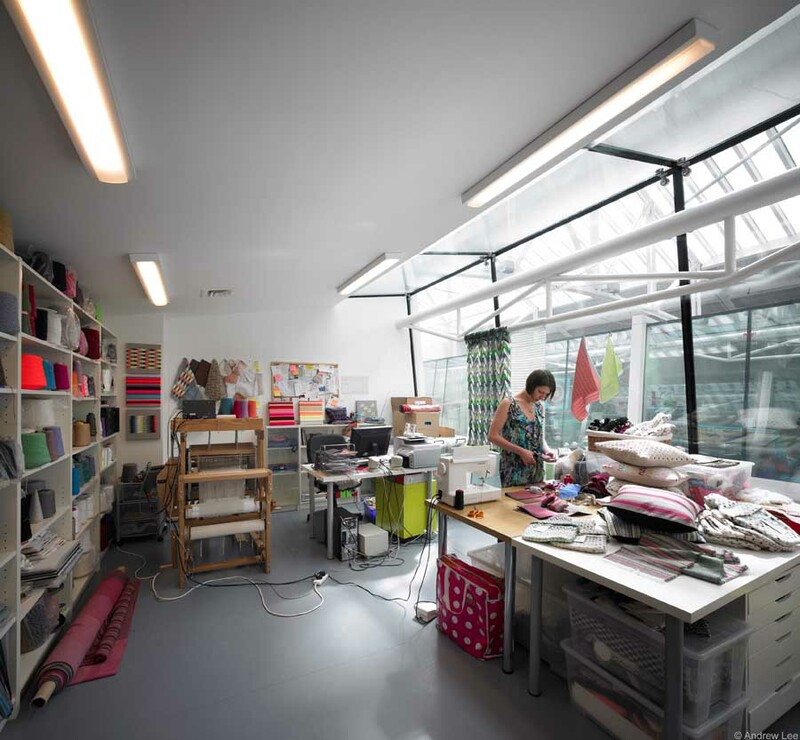 The existing double-height shop units were sub-divided horizontally by the introduction of a new full mezzanine floor, allowing the creation of a further level of studio spaces gaining natural light from Bridgegate itself. 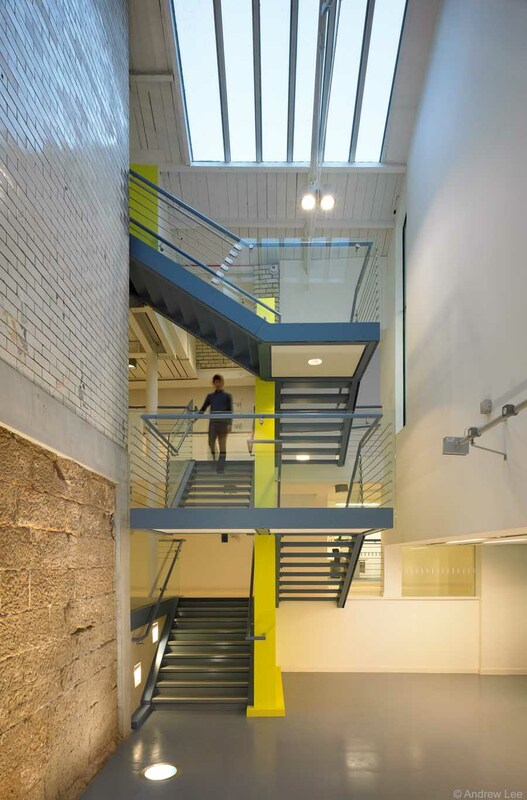 Within the existing volumes of the 1889 and 1904 halls and linked to the new Merchants Steeple Atrium and the main circulation core, a series of new `insertions` have been created that act as individual studio spaces for the artists. These new insulated and serviced spaces have been arranged to take best advantage of the daylight from the extensive glazing already existing in the roofs of the halls and have been detailed to ‘read’ as modern insertions into the historic fabric of the Briggait. 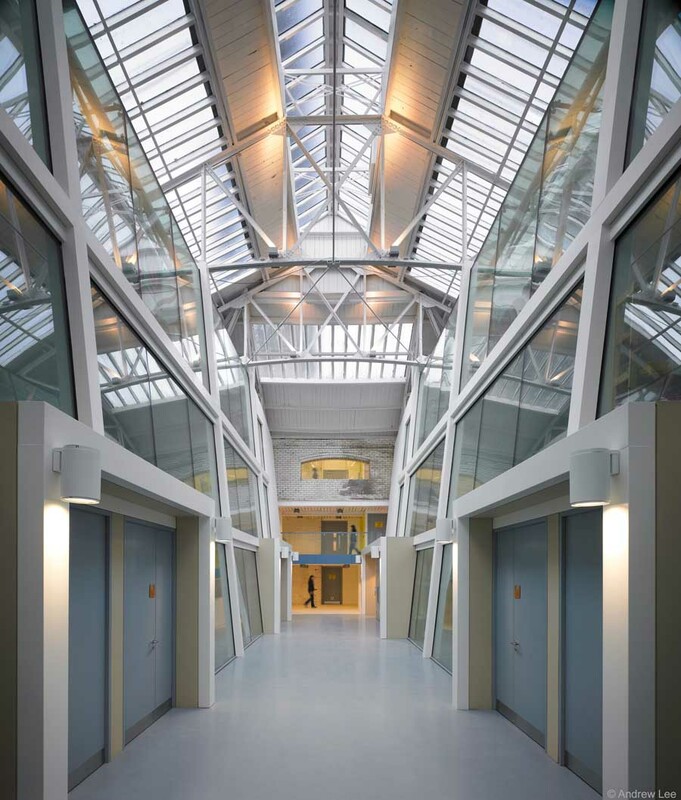 Scope: fit-out involves major downtakings & alterations followed by new mezzanine floor, glass atrium, curtain walling, roof glazing, new m&e installations and roof lighting.